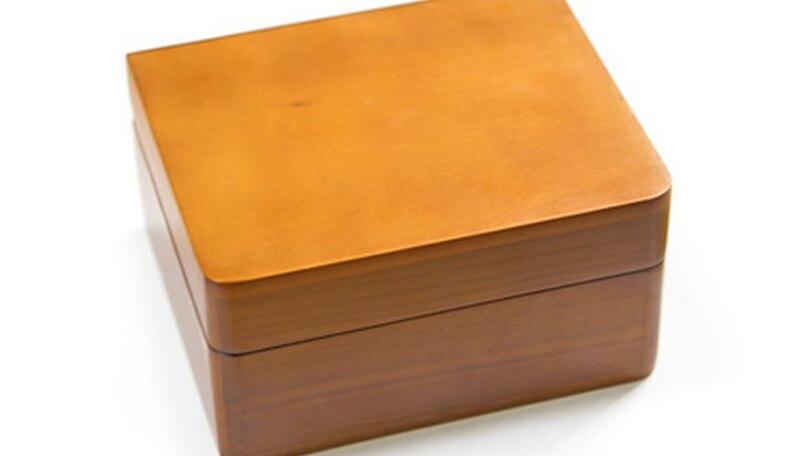 Customized boxes have been made for centuries for holding almost any type of item. History shows a number of hollow wooden boxes built for items ranging from maps to bodies. Building a hollow wooden box for your possessions or as a gift is relatively simple. Determine the size of the wooden box you require. Make a diagram of the box on graph paper including measurements for height, width and length for all six sides. Lay out the wood you are using for the project. Measure the dimensions of each side on the wood; use a long length of wood for the sides that has the height you want for the box. Measure the length of the first side and make a line at that measurement; measure the length for the second side and make a line at this measurement. Repeat this process until you have all four sides laid out on the wood. Cut the wood to size. Remember that you will need a top, bottom and four sides. Make the top 1/2 inch larger than the bottom on all four sides. Lay the top and bottom aside. Set up the four remaining sides to form a rectangle or square depending on your cuts. Apply a line of wood glue to the ends of what will become the back and front of the box. Apply the other two sides to the ends so that the inside of the remaining two pieces line up with the ends of the glued sides. Make all corners flush. Apply the band clamps to the frame. Square off the frame by measuring the distance from one corner to the opposite diagonal corner. When measured, the distance between all corners and their opposites should be the same. Adjust the frame as needed to square off the sides. Allow the frame to dry. Hammer a nail into center of the outer face of one side so that it passes through the outside face into the end of the front board. Repeat this at the other end of the same side with the back piece. Hammer a nail 1 inch from the top of the side board at the back the same way you attached the center nail. Repeat this process at the other end of the same board with the front board. Hammer a third nail 1 inch from the bottom of the side board at the back similar to the other two nails. Repeat this process again at the front board. Repeat step 6 for the opposite side to permanently attach the frame together. Remove the band clamps once this is completed. Line up the base of the box so that the ends and corners are flush with the sides. Apply a line of wood glue around the edge of the base. Turn the base over and align the base with the sides again. Set a book on top of the base. Allow the frame to dry. Remove the book. Hammer a nail into each corner of the base so that it passes through the base into a side. Hammer two more nails along each side equidistant from the corners with the nail passing through the base into the sides. Cut two pieces of wood the length of the left and right sides of the box. Make the pieces 1/4 inch to 1 inch thick depending on the project size. Fit the pieces into the box to ensure they fit snuggly. Remove the pieces and set these aside. Set the lid on the work surface with what will become the bottom of the lid facing up. Apply a line of wood glue along the left and right edges of the lid. Put the two wood pieces on the left and right side of the lid. Make the pieces flush with the edges of the lid. Allow these to dry. Put the lid on the box so the pieces are on the underside of the lid. These will hold the lid in place. Attach the handle to the center of the lid top. You can make a handle from a piece of wood, a brass handle or knob. Use glue for the wood piece or screws for the handle or knob. Remove the lid. Varnish all of the surfaces of the box. Allow the box to dry.